The Firefox browser maker has teamed with Swiss firm ProtonVPN to offer VPN services to users; each company gets a cut of the revenues from those who sign up. Mozilla launched new money-making projects this month, new attempts to diversify revenue, which relies almost entirely on payments from search providers - notably, browser rival Google. 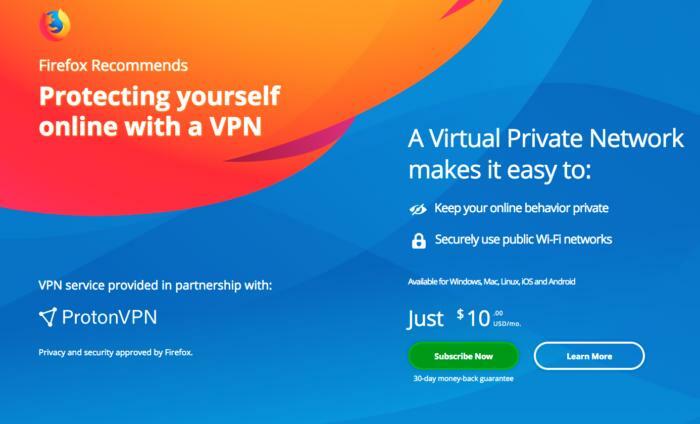 Starting today, some Firefox users will see in-browser advertisements for a VPN (virtual private network) service that encrypts all traffic and routes it through a secure server. "Across numerous studies we've consistently heard from our users that they want Firefox to protect their privacy on public networks like cafes and airports," contended Chris More, product lead of what Mozilla calls "Firefox Growth," in an October 22 post to a company blog. That feedback, More said, led Mozilla to its latest revenue-generating idea: selling VPN services. Mozilla will collect some of the cash generated by ProtonVPN subscriptions. "A portion of these proceeds will be shared with ProtonVPN, to offset their costs in operating the service, and a portion will go to Mozilla," More acknowledged. ProtonVPN was more forthcoming with information about the deal. "The majority of the revenue from these subscriptions will go to Mozilla, directly supporting Mozilla's mission," wrote someone identified only as "Inna M" in a post to the Swiss company's blog. The service sold to Firefox users will be identical to ProtonVPN's Plus plan, which covers up to five devices. Another recent addition to Mozilla's revenue streams, something called "Search shortcuts," will let the browser maker collect fees - commissions, actually - from online seller Amazon. A pair of icons, one marked "Google," the other "Amazon," on the new tab page will, when clicked, shift the cursor to Firefox's address bar and insert the "@google" or "@amazon" search keyword. Anything typed in the address bar after the keyword then becomes the search string on the designated site. The advantage: The user gets to search without waiting for the google.com or amazon.com page to load. Purchases that Firefox users make on Amazon after a search with the icon's assistance will put money in Mozilla's pocket courtesy of the e-seller's affiliate program. Commissions range from 1% (for video games) to 10% (Amazon Fashion). Mozilla owned up to the commissions. "In the spirit of full transparency ... we anticipate that some of these search queries may fall under the agreements with Google and Amazon, and bring business value to the company," said Maria Popova, senior product manager for Firefox, in an Oct. 17 post. It's no surprise that Mozilla has looked for new ways of turning a dollar. Although the open-source developer's finances - those of the Foundation that controls the company, anyway - were in good shape last year (the figures were for 2016), with revenue up 24%. But as always, the bulk of Mozilla's income came from its search deals: $474 million came from search contracts, accounting for 91% of all revenue during 2016. Most of that was paid by Google, which in return was made the default search engine for Firefox in the U.S., Canada, Hong Kong and Taiwan. Mozilla has explored alternate revenue paths before, including in-browser ads and an entire smartphone ecosystem, ranging from handsets to an operating system. All were abandoned in the end.